Performed in-the-round and enhanced by a guerilla filming style on a mostly bare stage, Great Performances: Julius Caesar creates a unique perspective on Shakespeare's tragedy. 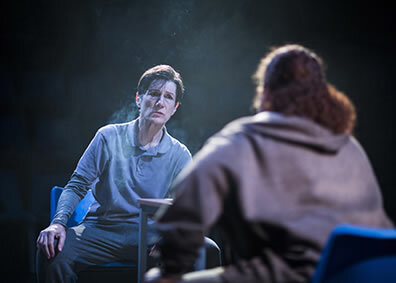 Harriet Walter (left) plays Brutus in Donmar Warehouse's landmark women's prison–set production of William Shakespeare's Julius Caesar, being aired on PBS Friday, March 29. Photo by Helen Maybanks, THIRTEEEN Great Perfomances. Donmar Warehouse's acclaimed all-female production of Julius Caesar set in a women's prison will make its U.S. broadcast premiere on Friday, March 29, as part of THIRTEEN's Great Performances series on PBS. Tony Award-nominee Harriet Walter stars in director Phyllida Lloyd's interpretation of Shakespeare's masterpiece which transferred to St. Ann's Warehouse in Brooklyn, New York, in 2013. Under the direction of Lloyd (The Iron Lady, Mamma Mia! ), Shakespeare's famous discourse on power, loyalty, and tragic idealism is heightened against the backdrop of female incarceration. The cast stars Walter (Sense and Sensibility, Mary Stuart) as Brutus, Jackie Clune (Borderline) as Caesar, Martina Laird (EastEnders) as Cassius, Jade Anouka (Cleaning Up) as Mark Antony, Karen Dunbar as Casca, Clare Dunne as Portia and Octavius Caesar, Shiloh Coke as Cinna the Poet, Sheila Atim as Lucius, Leah Harvey as Soothsayer, Zainab Hasan as Calpurnia and Metellus Cimber, Jennifer Joseph as Trebonius, Carolina Valdés as Cinna, and Sarah-Jane Dent, Rhiannon Harper-Rafferty, and Liv Spencer as guards. Shakespeareances.com's review of the St. Ann's Warehouse production is at http://www.shakespeareances.com/willpower/onstage/Julius_Caesar-08-DON13.html. Two versions of my review are posted—one with a spoiler alert—if you want to assure yourself that this is must-see TV. Performed in-the-round and enhanced by a guerilla filming style on a mostly bare stage, Great Performances: Julius Caesar creates a unique perspective on Shakespeare's tragedy. GoPros and a drone offer a stark reminder of the prison setting, and heavy metal music blasts to highlight the conflict on stage. The production was the first of a trilogy of all-female Shakespeare productions at London's Donmar Warehouse that The Guardian called "one of the most important theatrical events of the past 20 years." All three productions—Julius Caesar, Henry IV, and The Tempest—were set in a women's prison, inspired by a creative collaboration between prisoners, actors, and the production team in association with the theater company Clean Break and the York St. John University Prison Partnership Project. Julius Caesar was produced by Kate Pakenham and John Wyver. Great Performances is produced by THIRTEEN Productions LLC for WNET, one of America's most prolific and respected public media providers. Throughout its more than 40-year history on PBS, Great Performances has provided viewers across the country with an unparalleled showcase of the best in all genres of the performing arts, serving as America's most prestigious and enduring broadcaster of cultural programming. Bill O'Donnell is series producer and David Horn is executive producer. Major funding for Great Performances is provided by The Robert Cornell Memorial Foundation, the Anna-Maria and Stephen Kellen Arts Fund, the Irene Diamond Fund, Rosalind P. Walter, the LuEsther T. Mertz Charitable Trust, The Agnes Varis Trust, The Starr Foundation, the Kate W. Cassidy Foundation, The Phillip and Janice Levin Foundation, Ellen and James S. Marcus, The Abra Prentice Foundation, public television viewers and PBS. Great Performances: Julius Caesar premieres nationwide Friday, March 29, at 9 p.m. on PBS (check local listings) and streams the following day on pbs.org/gperf and PBS apps.